For more overlooked films go here. It's a sad fact that dozens of terrific films fall through the cracks each year, receiving only screenings through film festivals or getting only the most basic direct to video releases. 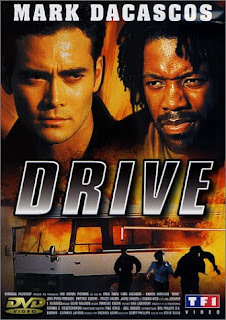 Such was the case with Steve Wang's DRIVE (1997), one of the best action films almost no one has seen. DRIVE features Mark Dacascos as Toby Wong, a Chinese soldier implanted with a device that increases his stamina and reaction time (in order to create the perfect assassin, of course). Wong wants none of this assassin business and hightails it to the USA in order to sell the device to an American corporation and live a normal life. Along the way he hijacks a failed songwriter (Kadeem Hardison) to drive him from San Francisco to Los Angeles, all the while being chased by hitmen who have instructions to recover the implant. The plot of DRIVE is completely beside the point. Director Steve Wang doesn't take any of it seriously and the film exists only to move from one action scene to the next as well as to show why Mark Dacascos was once considered to be the Next Big Thing in action cinema. He moves with the grace of a young Jackie Chan and even more importantly he can act. 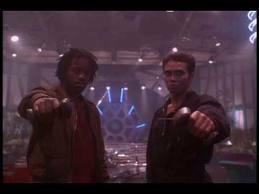 For once the character-driven moments are just as much fun as the action set pieces because Dacascos and Hardison interact so well, both together and with Brittany Murphy, who plays the manager of a motel they visit on their travels. They all look like they're having a great time and their enjoyment is infectious. DRIVE wasn't done any favors by Simitar Home Video who gave the film it's US direct to video premier in 1998 via an ugly, full-frame transfer which cut its Panavision framing almost in half. In addition, they cut the film by sixteen minutes, excising just about all the character driven moments that make the film special, including most of Murphy's role. The result was a film that looked like every other direct to video action film of the era: lots of car crashes and explosions but very little in the way of character or logic. The only was to properly appreciate this film is through the British DVD from Medusa, which not only restores the film's proper framing but also all the missing character beats. DRIVE is a wonderful movie, a near-perfect combination of action and comedy. It has no pretensions toward being anything important. It just wants to keep you entertained and amused for two hours, which is really all you can ask of this type of film. It's a crime that inferior films like RUSH HOUR, which this film superficially resembles, are able to generate hundreds of millions of dollars in revenue while DRIVE is collecting dust on your video store shelf. How can you not love a film that has a recurring joke about a TV show called WALTER THE EINSTEIN FROG ("That's one smart frog!")? Check it out if you can. I love this film and chances are you will too. It is staggering how many decent films (and much better than decent) are orphaned in the flood of thousands released (even as in this case sometimes barely released), when so much utter trash is hailed or at least propelled into the multiplexes (yes, I was thinking of WANTED, why do you ask?). Dacascos was one of the reasons that THE CROW television series was watchable, and better than it had any right to be, and I will make an effort to seek this one out (SO CLOSE got a much better shake than this one did, clearly, though in its theatrical run of sorts in the US, Alice and I were the only audience at our theatrical screening...the only other time that's happened to me so far was when my brother and I were the only ticket-holders to a screening of SMOKE). Missed this one. Time to fix that.